Sometimes walking or cycling can be much nicer than taking the car however this method can be a problem when there may not be any footpaths / cycleway or very little of them. This can be a bother. Even some of the footpaths or cycleway may not be a particularly safe route that you feel comfortable going down. Another trouble we are finding nowadays is the number of roads which don’t currently have any footpaths for pedestrians or have unclear markings for cycleway. Having cyclist on the footpaths can also be a potential hazard for you. At The Surfacing Company Ltd we have taken the time to gain the most efficient and suitable solution for you to ensure the highest quality service within the industry. 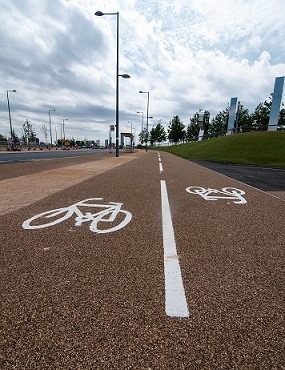 Our team take safety measures such as, adding sections on the road in colours which stand out, making cycleway safer for you, the last thing we want are cars driving in the wrong sections. We also like to split pavements into two sections, providing a footpath and cycleway, allowing a safe and pleasant travel for both parties. Our team have had over 15 years training to ensure the best service, providing not only efficient materials but also a fast service. We don’t want to make your travel route an inconvenience that is why our team try hard to fit our service around the most convenient time for everyone. Don’t wait for your life to be easier, simply give us a call today.